A younger friend of mine recently asked if I could help her find an internship in fashion, but I was at a loss. The problem is that she’s still in high school and most companies only hire students who are college-age or above. But as someone who’s known they wanted to work in the fashion world since a very young age, I began to think about what steps I took that helped me get to where I am today. Sending her my definitive list of tips and tricks was the least I could do, and since she’s certainly not alone in wanting a future career in fashion, I figured I’d share them all with you, too! Scroll down to read the 6 tips that are sure to give you a leg up when the job search begins. Simply liking a brand or a magazine is not enough to get you in the door. You want to be an expert—exploring it as thoroughly as is possible for an outsider. Want to work or design for a brand? Find out exactly who's helming the design team now, and how often that's changed. Look through old collections and get a sense of the brands transformation over time. Leaning towards an editorial position instead? Read the masthead and research what's actually involved in each position. Read the magazine front to back (or the website daily). Learn the different sections and verticals by heart. It's so easy to get in touch with people who work in the industry today that there's almost no excuse not to. You don't want to pester them, but reaching out once is perfectly acceptable. I can't tell you how many fashion world veterans I have cold e-mailed that have actually responded, and, in some cases, become longterm mentors. The key is to lower your expectations: don't expect them to offer you anything more than advice, but recognise the sheer value of that advice. Be polite and succinct, and most importantly, don't overdo it with the fan-girling. These are busy people and you'll be better off getting straight to the point. Having a creative outlet like this is important for both your personal growth and for giving other people a sense of your tastes. Tumblr and Pinterest provide the simplest routes for immersing yourself in fashion and curating your personal aesthetic, but if you've got the time, a full-blown personal blog is even better. The blogs I had growing up helped develop my personal style from a messy mishmash to sleek and minimal, while a recent blog noticably honed my writing skills over time. Like I hinted in my first tip, there's a lot more to the fashion world than the glitz and glamour you see on the surface. It will be enormously helpful to your career if you come into it with some background knowledge of how the business works. I began reading WWD and, once it launched, the Business of Fashion religiously and though at first I felt totally lost, I quickly picked up a solid beginner's knowledge of what goes on behind the scenes. The prettiest dresses don't always sell, your favourite designers don't always work well with others, and larger companies often dictate the decisions made by top luxury brands. Read up and you'll understand why. Simply put, you never know who knows someone in or around the industry, and, yes, connections are helpful. 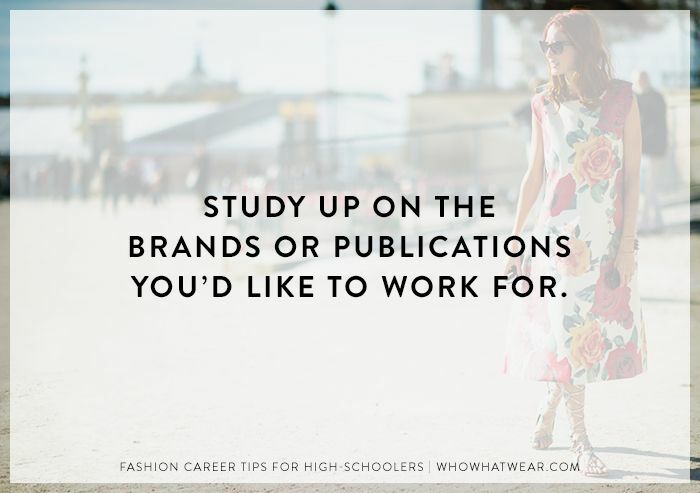 They won't set your fashion career in stone, but they could provide you with potentially-fruitful opportunities that you otherwise might not have had. Though you're still too young for a full-time job in the industry, it's important to get these people thinking of YOU as someone with a long-held passion for fashion. It may pay off down the line. While I was in high school I took fashion design classes at The Fashion Institute of Technology every Saturday. Though it wasn't what I ultimately decided to focus on, it helped me understand clothing in a way that I wouldn't have otherwise. I also got to work with professors who had intimate industry experience to share with us all. If you live near a big fashion school, find out if they offer any pre-college programs or check out the other schools in your area for potential pre-college art, writing or marketing courses that might line up with your interests. Do you have any other helpful tips to add? Let us know in the comments!